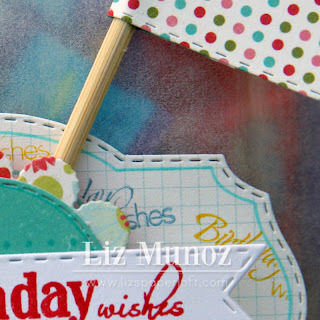 Liz's Paper Loft: My Creative Time's November Sneak Peek Day 3 ~ Birthday Wishes! 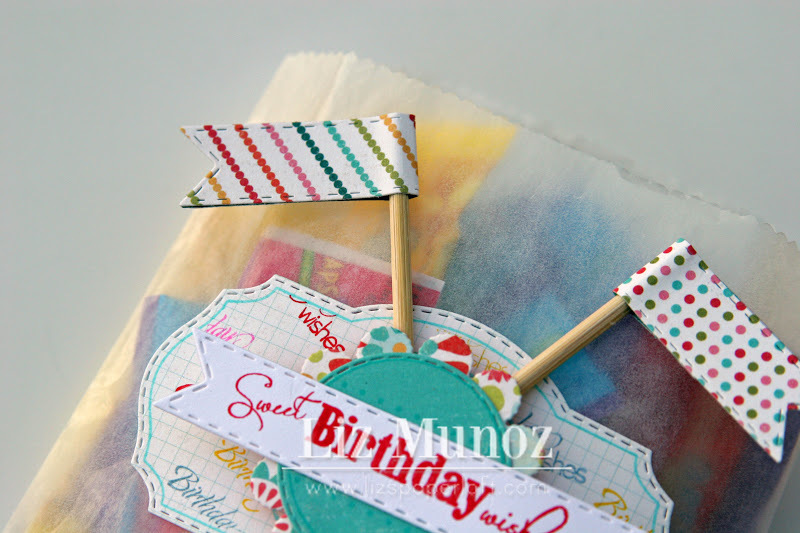 My Creative Time's November Sneak Peek Day 3 ~ Birthday Wishes! Happy Wednesday paper lovin' friends! Can you believe all the wonderful projects that the girls on the Design Team have been showing you so far?! I know we say this every release, but I really think Miss Emma has outdone herself again!!!! Well you've seen the Label Font and Circle Font set on Monday and the Lowercase Fun dies yesterday. 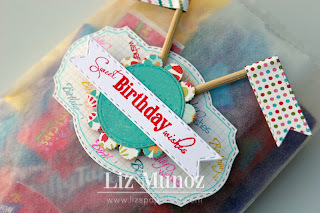 Now today you get to see the FUN and FABULOUS Vintage Label Die, Stamp Set, and Sentiments! You are going to love how this new set will coordinate with My Creative Time's existing stamps and dies! Emma is AWESOME, she is always thinking how to incorporate the things you already have and love with your soon to be new favorites! I stamped "birthday wishes" (Teeny Tag Greetings) inside the label. And popped up the Scalloped and Stitched Circle Die. The flags are made with the new banner die, folded in half! Of course all the dies have My Creative Time's Signature Stitching! Teeny Tag Greetings "birthday wishes"
Emma will randomly pick & announce all winners on Friday, November 16th during the release happening @ 8:00am PST in her video! GOOD LUCK! The wait is almost over, you will be able to purchase all of the new release tomorrow! Also I have a little surprise for you! So be sure to come back tomorrow to see!!! Miss LIZ, this could NOT BE ANY CUTER!!!! How FUN is your treat bag??? I just LOVE how you used the CUTE little banners into little flags!!! just AWESOME my sweet friend! Great job on your bag and I love the flags. Cya tomorrow for the hop!!!! Very cute treat bag, I love the way you decorated, thanks for sharing. This is so colorful and FUN, Liz! I love the papers you used, and your little banner flags are adorable!!! Very cute--love the little flags! This is awesome Liz!!! I LOVE LOVE LOVE these new stamps and die!!! Another great day of projects!! So fun and cheery! Love it. Lovely this bag and very colorful. I like the way that you used the label die. Thanks for share. This is ssoooo stinking cute. I will have to try this. Love how this dresses up the simple glassine bag. A perfect treat. I love this baggie! you did an awesome job on all the embellies!! love the papers and colors! thanks for sharing! Super fun and cute label for the birthday treat bag! Love the colors and yes I believe that Emma has really out done herself on this release!!! what a sweet project, love how you used the dies and stamps. How fun! I just got some of these little bags from you and wasn't sure what I was going to do with them...now I know! This is just adorable...I love it soooo much! Thanks for the great idea! How sweet are these favor bags you made?? It does look like a lot can be done with this newest release. Combined with older releases...Oh My! I am going to love this release too. Very nice idea!! Love the label! You decorated the bag so fun and festive! Love the flags you made out of the banner die! What a great way to decorate a bag! Love this! How cute are these! Just love the flags, they compliment the bags well. This is a very fun treat bag! I love the bright colors. Liz - this super cute treat bag is EXACTLY the inspiration I needed to make soemthing special for my little niece. Whoever receives this will be happy-dancing, for sure! You've showcased Emma's new releases, and your boutique special items wonderfully. Note to self: add glassine bags to wish list...Thank you for sharing!! 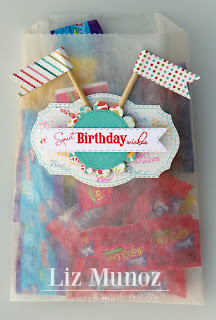 What a super cute treat bag:) Love the glassine baggy, I need to get some of those. Looks like an awesome release! This is the cutest bag ever. I love how you have done it. Emma's dies and stamps made it just perfect.! I love these b and I'm going to need to place an order. Your colors are great. I love how you incorporated several products into this one item. What a cute bag. I love the bright colors. Liz ~ What a CUTE, CUTE little treat bag! I am so HAPPY I just ordered those glassine bags!! They came the other day ~ I am so EXCITED to make something with them!! I have to say yours seriously is FABULOUS! What a fun idea to give someone birhtday wishes!!! LOVE it!!! Everything that you make is perfect. I love visiting your blog. Emma's stamps are beautiful and your creative style makes them all the more lovely.